Interestingly Melbourne has a “Director of Design” at its City Hall, whereas we have a “Director of Planning.” Language usually means something, if you know what I mean. While we have made a few interesting moves lately, it is still unclear what we are planning here, and some accelerating crises are going ignored. Compare Adams’ vision to what’s happening here. We may have made some progress in the bicycle and transit department lately, despite some 1950s-style dinosaurs fighting bike lanes (who incidentally drive me absolutely around the bend. What century are we in?). But in terms of general urban design, we are still doing very badly. A dire property speculation crisis and a City Hall under a stranglehold by vision-less developers (these two things are not unrelated) are both serious impediments to our doing anything as thoughtful here as they’re doing in Melbourne. And those benefitting are the ones blocking change. For obvious reasons. Rob Adams: We’ve got the same issues I suspect you have [in Vancouver] – the road space is given up begrudgingly to bicycles. Our challenge now is to get a quality bike route where you protect the bikes from the cars – a bit like Copenhagen – and if you don’t do that you’re not going to get bike use up past 10%. CBC: You’ve only been here for a while, but have you had time to look at how bike lanes are constructed here? Divided bike lane, Vancouver. Adams was impressed. We desperately need better design creativity inside and outside City Hall in this town. The bike lanes are a good start, but we have to halt some of the Tall Naked Capital architecture we are filling our city with. Having fought our Director of Planning this year while he gunned for a mega-casino smack in the middle of our downtown, let’s just say I’m not his biggest fan. When Harvard Architecture’s Loeb Fellows were visiting Vancouver last week, one of them tweeted about Vancouver “can you have good urbanism without good architecture?” and I cringed. He might as well have asked “can you have good urbanism without good urban planning?” Answer to both is equally obvious: no. The architectural poverty of the condo towers thickly spreading east from Vancouver’s downtown core didn’t impress anyone. We need a Rob Adams equivalent here. And we desperately need to get on top of the property speculation as soon as possible—as Melbourne is already successfully doing. Because that destroys the livability, affordability and aesthetics of cities faster than anything else. And Vancouver City Hall is doing nothing about it. We are getting a city that becomes more unaffordable and more inhumanly designed every year. More on Gordon Price’s blog here. This entry was posted on Tuesday, October 25th, 2011 at 1:22 am	and is filed under architect, architecture, British Columbia, cities, design, landscaping, politics, urban planning, Vancouver. You can follow any responses to this entry through the RSS 2.0 feed. You can leave a response, or trackback from your own site. […] More here on Rob Adams visit at Ouno. The bike lanes in Vancouver are a very good idea, they definitely encourage people to ride their bikes, however some of the bike lanes are an accident waiting to happen because they intersect with cars turning left and right and sometimes cars blow through red lights….. as do people on bikes…. and if your trying manouver after running a red light your not necessarly looking out for people on bikes, nor are they looking out for you. The roads have also become much more congested in rush hour traffic due to the loss of lanes which have been dedicated to bikes. It also rains for 6 months of the year in Vancouver, therefore no-one rides their bikes becuase they dont want to turn up for work soaking wet – so the bike lanes are mostly empty during the bad weather and the roads are all backed up with traffic because of the loss of lanes to the bikers. 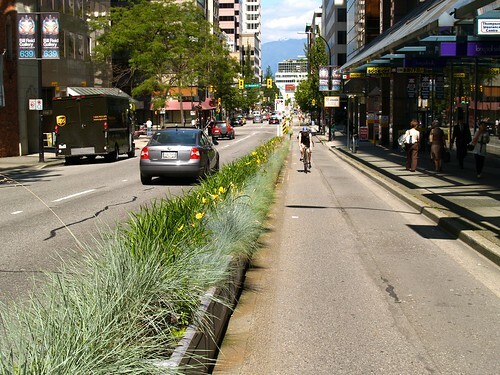 Bike lanes do work but they have not been implemented very well in Vancouver – if anything they have been put in with not much thought regarding loss of parking, increased congestion etc. Complaints like this surface in every city that implements bike lanes. Congestion must be dealt with by transit and cycling – peak oil was 2007 at most estimates and we simply have to decrease the burning of fossil fuels, full stop. People are accustomed to the days of cars being king, but I’m pretty sure those days are numbered. More than 50% of humans now live in cities, so this is where it has to happen. Also, if you lived in my neighbourhood you’d see that people bike rain or shine, summer and winter – they don’t have much choice, for one thing. It’s so expensive in Vancouver that many simply don’t have cars anymore. The Adanac bike route is packed with people. It just seems to me this is the wave of the future. Certainly I think divided bike lanes are the answer, as New York, Copenhagen, Melbourne and many other cities are doing. I agree there will have to be lots of fine-tuning. And more transit.